We’re now well into the new year and like many businesses, you’ve probably seen a drop off in new deals after finishing Q4 on an upswing. Now here you are closing in on the end of Q1 and scrambling to hit your numbers for the quarter. To accommodate for this scrambling you reprioritize tasks, and unfortunately, some of the activities that are key to a full pipeline and consistent revenue growth fall by the wayside. In other words, you’re probably neglecting PROSPECTING! This is a slippery slope, and if you’re not careful, it’s easy to fall into this dangerous cycle quarter after quarter. A few months back we published a blog post on letting a prospect go. Qualifying or disqualifying them quickly is important, but so is following up when your solution simply didn’t align with their initiatives at the time. Just because you disqualified them in Q1 doesn’t mean they won’t be a good prospect heading into Q3 or Q4. Challenge your prospect on why things will be different in a couple months. Are they just blowing you off, or are there legitimate reasons for the delay? If it’s the latter, drill down on what they say to really understand the company’s initiatives. Remember: Everyone has their own perspective on company initiatives and projects, based on their specific role. Taking time to understand not only their perspective, but what’s important organizationally and why, will help you understand whether that prospect’s a fit and if so, how to craft a timely message that aligns to their goals. This song was a number one hit by The Byrds way back in December of 1965. The original song title, however, was “To Everything There Is a Season.” And it’s true in sales. Try to identify seasonal buying patterns with your customers and adjust your efforts accordingly. If you sell to retail organizations, it’s highly unlikely they’re going to implement anything during the busy holiday shopping season. Likewise, educational institutions are reluctant to implement new technology during the middle of the school year. Look back on your historical data to see when particular customers buy, and if you’re a sales manager, be highly suspect of any deals your team’s forecasting that fly in the face of logic. 3. Show me the money. Salesforce.com recently published an infographic on sales call preparation. All great tips, but there’s one more I would add. Don’t neglect the customer’s budget cycle. In your prep, it’s easy to figure out when their fiscal year ends, and it’s an important nugget of information to have in the back of your mind to help gauge the immediacy of any opportunity. Not to say they can’t or won’t find money in this year’s budget for your solution; it just requires a frank discussion with the customer to resolve. If you follow these tips and adjust the time you spend on your pursuits accordingly, you’ll be well on your way to consistent revenue quarter after quarter. 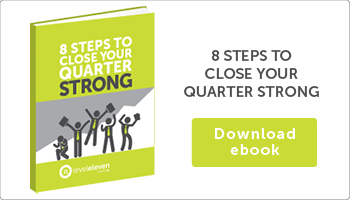 These 3 tips for sales teams can help deter end-of-quarter scrambling.